ANC Future Centre announces a special scholarship programmes are offered by Murdoch University worth of AUS$ 10,000. 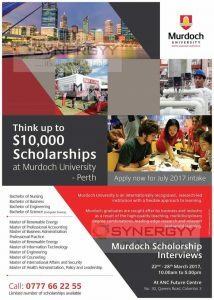 Murdoch University is an internationally recognised, research-led institution with a flexible approach to learning. Murdoch graduates are sought after by business and industry as a result of the high-quality teaching, multidisciplinary L degree combinations, leading-edge research and relevant real-world learning. Scholarships are offer for the July 2017 intake on below degree programmes.